Smithy's Bunkhouse01873 853432work BunkhouseSmithys Bunkhouse is situated on a working hill farm in the Black Mountains of the Brecon Beacons National Park. Designed with the group market in mind, independent travellers are welcome. The pub at the end of the farm drive does restaurant and bar meals and has a reputation for good beer and an amazing range of whiskies. Guests are able to walk directly onto the Sugar Loaf or Skirrid Mountains if they don't want to drive further into the Black Mountains. The accommodation consists of two dormitory style bunkrooms each sleeping 12 with additional space available above the common room which is used by the group leaders/teachers or the snorers!! The common room has a log burning stove and piano ! A fully equipped kitchen with a 6 burner commercial gas cooker, microwave etc. 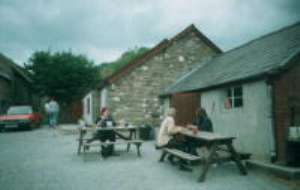 Smithys Bunkhouse is situated on a working hill farm in the Black Mountains of the Brecon Beacons National Park. A coin operated washingmachine and commercial sized drier are available for use in the unlikley event that it may rain in Wales! Excellent Local Inn - 5 minutes walk Children welcome from any age. From the south enter Abergavenny on the A40 heading towards Brecon. On passing Judd Bros. Commercial Vehicle garage(a lot of white vans on the forecourt) turn right into Pen-y-Pound. Follow this road through the traffic lights, past the school and up the hill for approx. 2 miles.You will enter the hamlet of Pantygelli, then, opposite the Crown Inn (slightly set back), turn right down the farm drive.Please drive carefully. Abergavenny has a main line railway station and coach/bus station. A variety of Taxi firms are available at reasonable rates.